Got any? Drop 'em here. And if you don't already know...it's only one more day until Book 4. No, I'm not actively cranky...although give me a few minutes and I'm sure I can think of something. Seriously, I did just crank out some reviews so check out the feed. Would you like the books categorized by rating, or by date, or some other logical method that you'll share with me? Please vote at your convenience. There may or may not be a prize. Chances are pretty good though, don't you think? Here's the deal. I don't think "real" bookclub questions work as well in an online format. Because fostering discussion is difficult when readers aren't all present. But I still think it's important to have a place where you can unload your thoughts on a book you have read. Starting retroactively with Love Walked In, I will be posting the same questions for every book. I would like to invite you to ask questions that you would like answered, or start discussions about whatever you wish, but the standard questions will be easy and you will be able to answer them fairly quickly. This format will also allow me to post more than just one book at a time. Hopefully, this will result in more of you sharing your thoughts on what you've read, without the intimidation of writing mini essays. Right now, these are the questions I have compiled - I am open to suggestions, of course. Did you enjoy this book? Why or why not? Was this a story you would normally enjoy, or outside your normal genre? Do you have a favorite quote to share? How would you change the ending or what would you like to see different? If your're like me and sometimes picture the characters as if you are watching a movie, who did you see in the different roles? Please rate 1-5 (of course, you may use half or quarter stars) and explain your rating. During the month of September we will use these questions, but I will also have questions for author Joshua Henkin. He will be checking in to see your questions for him, as well. The wrap up: I will still choose books that I think would be good for this type of discussion. You can request books to add to the discussion and ask additional questions. I will be answering the qs only after 3 people have already commented. Sound good? Does this make you more willing to participate? 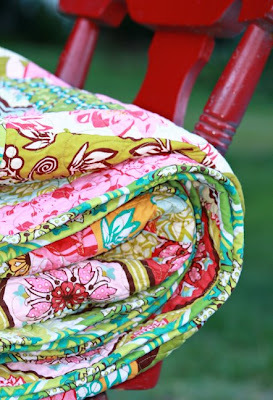 Please share your thoughts for lit*chick lite. You all have given me lots to think about with book ratings, I have enjoyed reading your responses. I think the plus/minus system is good and I also think I will start to catalogue my not-gonna-finish books. After seeing your thoughts, I realized that depending on the book I sometimes make instant decisions, but if something seems a little off - I'll read reviews to see if anyone has put into words what I am feeling. Anyhow, thanks for sharing. On a sidenote, if you would like goodreads to add half stars, I emailed them last week to ask. I received a reply that noted my vote for half stars. They apparently have an ongoing office discussion about it - so if you feel strongly, send them a note. I for one am strongly in favor. Lots going on this week - look for reviews for: Undiscovered Country, The Legend of Colton H. Bryant, Persepolis, and The Wednesday Sisters. Tomorrow is the lit*chick field trip to Politics & Prose for the Ann Patchett visit. It's not too late to meet us there, or ride along if you're interested and in the dc metro area of course. The bus leaves Columbia at 6pm...so let me know. Somewhere in between all these happenings I will unveil yet another incarnation of the online bookclub. I think you're going to like it better. And it should make everyone's participation (including mine) easier. I refuse to let that dream die - I think it can work. The next book is They Did It With Love in 2 weeks. What's your book week look like? I loved Pippi as child, and had not yet pulled out my beat-up old copy to share with the boys. But when KWB found this at the library..."Hey look Mom, it's Charlie & Lola" I knew the time had come. Lauren Child's illustrations make Pippi come alive...it's a perfect combination of a classic story and cool artwork. 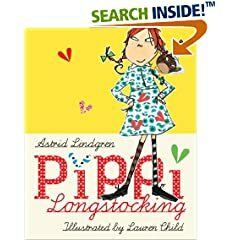 If you're thinking about adding Pippi to your list, this edition would be a fun one. And there is a new review in the feed - for Savvy by Ingrid Law. Lately, I have been frustrated with the 5 star book rating system. I could really use some half stars or quarter stars for that matter. But since that is what is available - amazon & goodreads - i will attempt to explain how I use it. 5 stars - loved it, absolutely, adding it to faves list. I realize that I rarely give 1 or 2 stars, however I don't think it's because I'm overly generous with the stars. Rather, I've honed my book selection skills. And the 50 page rule helps too - I don't finish books that would probably get a 1. (Should I still rate books I don't finish?) Especially since the advent of goodreads, now I can check and see what my trusted bookworm friends think. And it helps. The last four books I've finished have all been recommendations that I would not have read otherwise. I loved them all. Okay, when I arrive at the end of the book, I immediately have a gut reaction. This reaction doesn't necessarily take into account how the book was written but rather my feeling about it the instant I finish. Then I start to think about whether any characters annoyed me, or were poorly drawn. Was the writing tight and well edited? Did the story flow, make sense, was it compelling? Would I pass it along without hesitation? Could I suspend my disbelief in some cases? Was the ending satisfying? Before you think that I engage in deep analysis, the above questions fly though my mind in the span of about two minutes. And I make my decision. Usually the book falls to the in between rating of say, 3.75 and I have to round up. If it's in the 4s, even higher than a 4.5 I usually round down to a 4, only because I like to be a little more picky about handing out 5 stars. I wonder is that how most people rate books? What do you think about when you finish? the delightful Trish at Hey Lady! tagged me. I thought this would be easy as I am a woman of few words...i was wrong. all you have to do is answer the questions with one word, and tag four people. okay- your meme if you choose to accept it...laura, jill, carrie k, & mindi...have fun! I'm almost caught up. Phew. Such is the life of a procrastinator. is at Old Red Barn Co. and is being GIVEN AWAY. Unbelievable, really. So go enter here. I'm going to a party. The early release party for Breaking Dawn at my local B&N. It is meant for teenagers. Or nerdy adults like me. Some would say, ahem, that I act like a teenager. I am bringing my niece. So now I'm a cool aunt. Instead of an aging book nerd. *check your local stores for a similar party, er event. but you didn't hear it from me. maybe you know a teenager you can borrow. EDITED: Parties are scheduled for August 1st....so don't panic.